For their latest, Austin’s the Nightowls head straight to the source to create an album worthy of inclusion alongside the many classics to have come out of the legendary Fame studios. 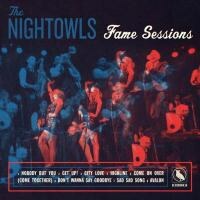 Austin-based 10-piece the Nightowls’ decision to record their latest at Fame Studios in Muscle Shoals simply makes sense. The eight originals on Fame Sessions perfectly capture the sound and feel of the countless iconic sides cut at the legendary studio during its heyday. While more slickly produced than their spiritual predecessors, one can still hear the ghosts of soul singers past haunting the album’s tight half hour runtime. Lead vocalist Ryan Harkrider’s timbre manages to sit between that of contemporaries Bruno Mars and Sharon Jones, capable of the former’s silky smooth phrasing and the latter’s raspy soul shouting. Backed by a sprawling cast of musicians, the group taps into the best of Aretha, Sam and Dave, Motown and a host of soul luminaries. Both “City Love” and opening track “Nobody But You” could easily pass for lost classics were it not for the at-times distractingly slick production. By no means a backhanded compliment, instead it speaks volumes to the overall quality of the material. Given its place of origin, it’s simply a little jarring to hear such a modern-sounding album after years of consuming the countless classics produced in Muscle Shoals.